Franck Jalleau and the Type@Paris crew. This second week started with Malou Verlomme on Monday 22 June 2015 morning. Starting from their last week letterforms modeled from their own writing, the attendees have to explore their shapes. The main idea behind that was to understand that a particular style have to adapt to any weights, any contrast. A good way to confirm the solidity of a concept: Does the thick and thin strokes ratio works with serif weight? Does a terminal still make a sense in a different weight or contrast… On the afternoon, it was the last session with Franck Jalleau for which students have to finish their humanistic project. This project closed down the first part of Type@Paris 5 weeks program dedicated to build up the foundations. The following weeks have been dedicated to their main typeface project. It’s never easy to start a new typeface, specially the first one. A good typeface should have a purpose, as its function and context help to discuss its style during type crit. Vague purposes are better than nothing, but clearly just designing a typeface for screen, or newspapers, or signage isn’t enough. We pushed the attendees to try to go a bit more far, like I will design a typeface for the body text of “this” magazine based on “this” country. Such distinction help a bit to find the appropriate style, even if at the end the object of the course is to learn the process of designing typefaces and the final typeface will be usable for many more topic that “this” magazine on “this” country. Already, Nadine Chahine and Mathieu Réguer initiated some discussions the week before about the design brief. But we have to go more far, it’s why I have set up two groups for a visit and meeting at Typofonderie library: One, right after the visit at Bibliothèque Nationale de France on Friday 25 June 2015,, the second one on Monday 29 June 2015 evening. We spent three hours to discuss individually about their concepts and how practically transform them on a suitable typeface project. As in many type foundries, we have a large collection of books realted to the history of typeface, type specimens and so on. So, it was easy to point out few books to each attendee, to help to built correct references, names of designers, periods, styles, historical typefaces. 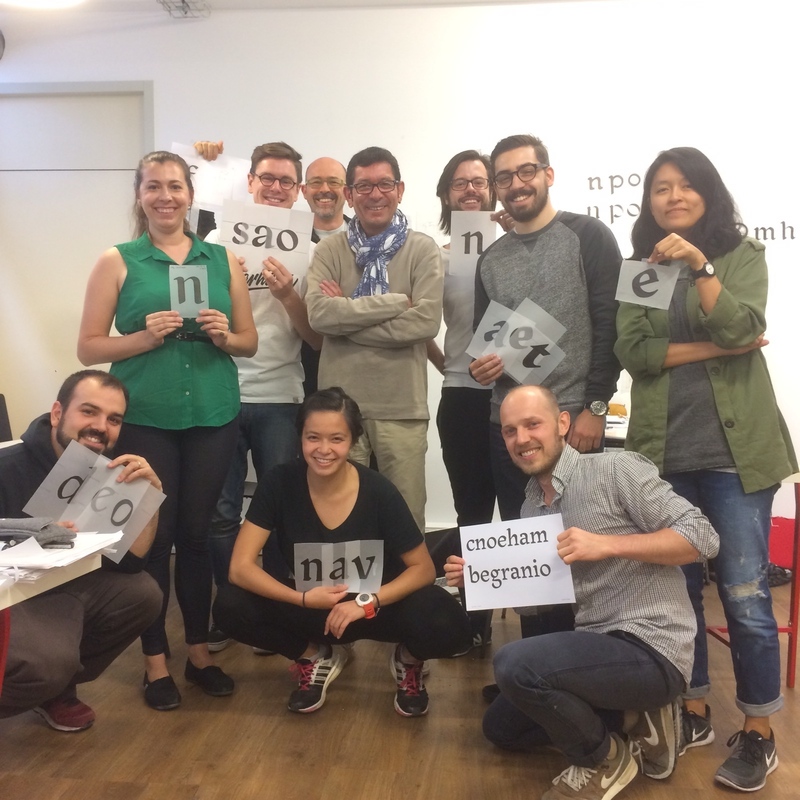 On the next Tuesday morning, Malou Verlomme and myself take time together with the attendees to review all typeface projects before the big move to the personal typeface project. Jeremy Tankard arrived on Tuesday 23 June 2015 afternoon. Most of the attendees already worked on some initials ideas, so to meet Jeremy, it was right on time. Enough early to discuss, to confirm the earlier sketches. In some cases, it came be confusing to have to many people visiting the class, but its part of the process, the confrontation help to strength how ideas. Each weeks, Wednesday are dedicated to the type crit in parallel to the normal course. Every hour, a group of attendees visited Jeremy when the rest of the class staying with Mathieu Réguer and myself. This first Wednesday type crit session was great. With his Talk on the evening, we all realized that he isn’t the typical type designer: For each of his project he discuss the concept through a long journey of sketches, analysis, shaping slowly the right letterforms. It was really an inspiring day for the attendees. Many thanks Jeremy! Wednesdays are special at Type@Paris as we also set up Talks during the 5 weeks. The Talks are in a separate place, call (Le Tank,)[http://letank.fr] a cooworking space near Bastille in Paris. Each Wednesday two speakers and a facilitator. The evening started with a great presentation (sadly a bit short) by Ludovic Houplain and Rachel Cazadamont from H5, followed by Jeremy Tankard Talk (to long to fit on the livestream). The Bibliothèque Mazarine is on the heart of Latin quarter in Paris, on the Institut de France in the same buidling of the prestigious Académie Française. “In 1642, the year he entered the Royal Council, Mazarin decided to move into the Hôtel de Chevry-Tubeuf, located near the Palais Royal where the comp balconregent, Anne of Austria, and the young Louis XIV were living. He ordered major extensions and refurbishment and in 1644 commissioned François Mansart to build the upper and lower galleries for his art collections. Le Vau’s first plans and elevations date from 1662. The building, which harmoniously combined the heritage of Italian baroque and the new ambitions of French classicism. The Mazarine Library actively renewed its function as a public library, welcoming its first readers in 1691.” We’ve been very honored to be able to visit the place and enjoy a fantastic collection of books. The first Gutenberg bible (1455) was presented to us as many others books, from Konrad Sweynheym et Arnold Pannartz (1469), Johannes et Wendelinus de Spira (1470), Nicolas Jenson (1470) to Henri Estienne (1508), Nicolas Jarry (1658), Giambattista Bodoni (1769), etc. Next week will mark the passage from tracing paper to the computer. More #tptalks15 on Wednesday too: Register now. → Register now for #tptalks15 1 July 2015 featuring Claudia de Almeida + Henrik Kubel.